THE TENTH GYALWA KARMAPA, Choying Dorje, took seven steps in each of the cardinal directions at birth. By the age of six, he could paint better than any of his teachers and was a gifted sculptor. 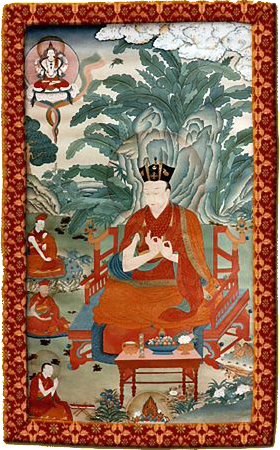 Choying Dorje foresaw the wars and political strife that were soon to come as a result of the Gelugpa-Mongol pact against the King of Tsang, whose family, followers of the Kagyu lineage, ruled most of Tibet. Thus, the tenth Karmapa distributed his wealth among the poor and needy and made Gyaltsab Rinpoche his regent, knowing he would be absent for a long time. There was much bloodshed as Gushri Khan's Mongol armies attacked first Shigatse and then the Karmapa's own camp, wreaking havoc and death. His followers saw Choying Dorje flying off through space holding the hand of his chief attendant. They 'landed' in the forests of Bhutan and spent more than three years living wild, helped by animals. They eventually went to what is today northern Yunnan, where the local monarch received them joyously. Altogether the Tenth Karmapa spent some thirty years in exile. As always, wherever he went, he fostered the Dharma and recognized incarnations of Kagyu tulkus.